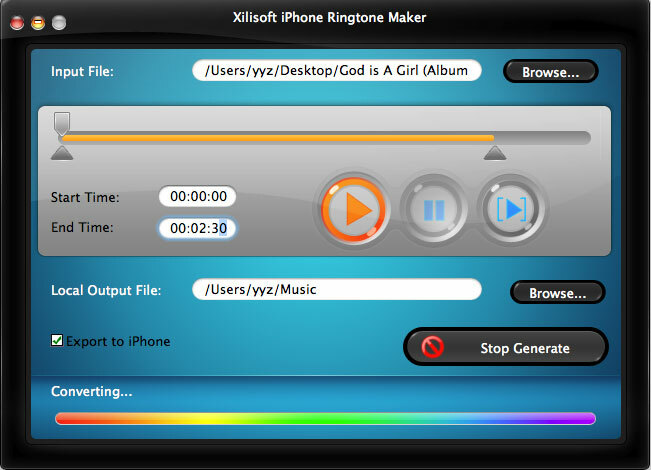 Xilisoft iPhone Ringtone Maker for Mac is designed for Mac OS X and iPhone users to create and transfer customized free ringtone to your iPhone. With this iPhone Ringtone Maker, Mac users can make ringtones from any digital audio file including WMA WAV RA M4A MP3 files and popular videos like AVI WMV DivX MP4 H.264/AVC AVCHD MKV RM MOV XviD 3GP and MPE. The ringtones you create can be directly sent to your iPhone and set as your iPhone ringtone. 5. The iPhone Ringtone Maker for Mac provides several interface languages to choose: English, German, Japanese and Chinese. Qweas is providing links to Xilisoft iPhone Ringtone Maker for Mac 1.0.13.0616 as a courtesy, and makes no representations regarding Xilisoft iPhone Ringtone Maker for Mac or any other applications or any information related thereto. Any questions, complaints or claims regarding this application Xilisoft iPhone Ringtone Maker for Mac 1.0.13.0616 must be directed to the appropriate software vendor. You may click the publisher link of Xilisoft iPhone Ringtone Maker for Mac on the top of this page to get more details about the vendor.